For the second in a five part mini-series, it could be easy to argue exactly how much of a Deep Space Nine novel The Crimson Shadow really is. Although its Next Generation credentials are obvious, the fact it revolves around the political turmoil of a major DS9 planet does point in the direction of that series. That said however, it’s not as though The Next Generation has ever treated the Cardassians delicately, David Warner notwithstanding. Despite the inclusion of characters from both however, The Crimson Shadow is first and foremost simply a Cardassian novel, with any other setting taking second place; as with the recent Typhon Pact books the lines between TV series are becoming increasingly irrelevant. Also like Una McCormack’s previous novels, this is a story of an entire people rather than just those few who tell it. And it is through this ability to tell the big picture from a small perspective that McCormack brings out the full potential of what a Star Trek novel can be. As Trek at its best not only is this tale of another world both highly enjoyable and also relevant to our own – the withdrawal of allied troops cannot be taken as mere coincidence – but her writing is second to none. The opening narration is reminiscent of Dickens himself and the depiction of the various levels of unrest, from boots on the ground to the offices of government, are handled with a level of skill that belies the fact this is only McCormack’s fourth full length Star Trek novel. Despite this however, it is the meeting of two diplomatic heavyweights, Elim Garak and Jean-Luc Picard, where The Crimson Shadow shines. The depiction shows not just her in-depth knowledge of these disparate figures, McCormack’s particular fondness for Garak is no secret and as such his own story is the most compelling, but the interplay between the two is as engrossing as the rest of the novel combined. Despite such a positive rendering of those characters that are included, the heavy political themes of the novel do tend to leave some left out; Geordi La Forge in particular is once again relegated from major player to the smallest of appearances. 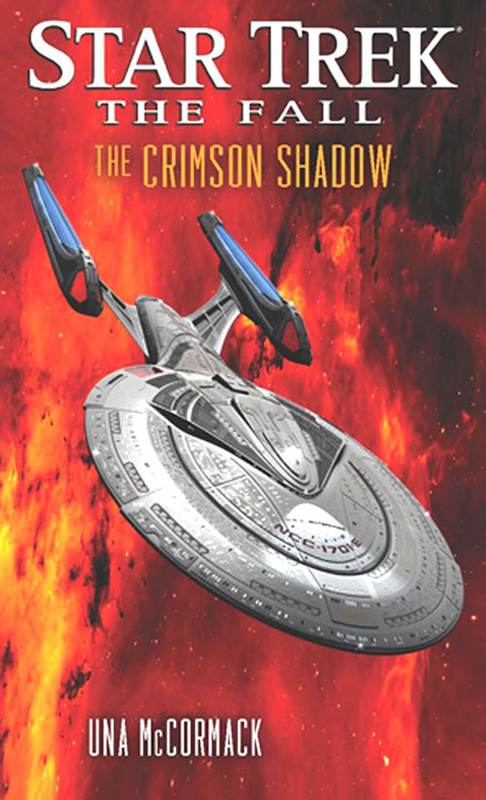 Overall this novel presents such a powerful account of one of Star Trek‘s most influential races that it is easy to forget The Crimson Shadow is designed to be just one part of larger whole. Regardless of the Federation’s aid, or even the Castellan’s leadership, Cardassia couldn’t be in better hands than Una McCormack’s. This entry was posted in Books, Reviews, Science Fiction, Transmedia and tagged Star Trek, Star Trek: Deep Space Nine, Star Trek: The Fall, Star Trek: The Next Generation, The Crimson Shadow, Una McCormack by Ian. Bookmark the permalink.